These days, reality shows set in Alaska abound. They’re certainly not all realistic (television needs drama, after all! ), but these shows do give us insight into some unique challenges of living and working in the Great Land. Here are five facts you can take away from a few of our favorite shows to help you prepare for your own visit to Alaska. The Discovery Channel’s “Deadliest Catch” features the dangerous life on commercial fishing vessel in search of the lucrative king crab. Why is it called the “deadliest” catch? Because these fishing workers have a fatality rate about 80 times higher than the average rate for all workers. 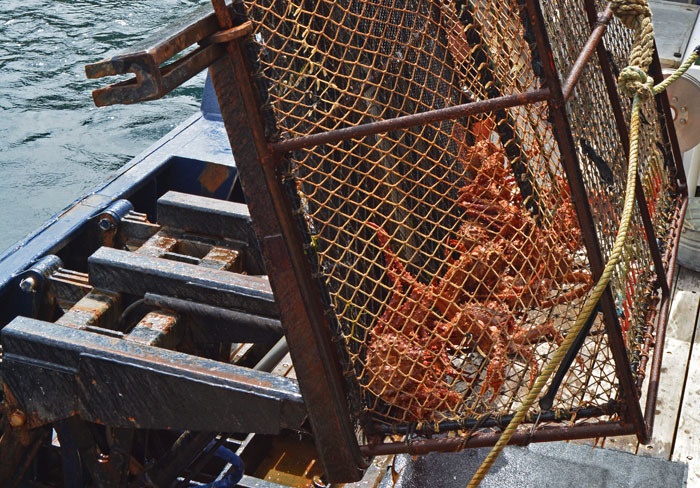 The delicious king crab legs you’ll enjoy at your favorite Alaska restaurant are undoubtedly part of the bounty from the short crab fishing season in the treacherous Bering Sea waters. That leg you’re snacking on might even have been caught by one of the “Deadliest Catch” crew out of Dutch Harbor. Fact 1: The crab you’re eating is a true king, not a queen or a prince. All female and juvenile crabs are tossed back into the sea. The fishing industry is one of Alaska’s most important industries – not only for crab, but for other important species, including salmon. National Geographic’s “Alaska Fish Wars” shows us these commercial fishermen jockeying for position during the short salmon season in Cook Inlet, stretching out 900-foot nets to catch returning salmon. Fact 2: Salmon take four years to reach maturity, and they will travel hundreds of miles from open ocean to return to Alaska rivers such as the Kenai and the Kasilof to spawn. The 1890s was a boom time for settling in Alaska – the discovery of gold brought thousands of hopeful fortune-seekers to the Last Frontier. The Discovery Channel’s “Gold Rush” shows us that fortunes can still be won (or lost) on gold in Alaska. Adventurous risk-takers stake everything on the chance to find those happy nuggets, making huge investments in claims, equipment and personnel. Miners try both new and old methods to get the gold: Miner Tony Beets even got a 75-year-old gold dredge up and running for his operation. It’s a serious venture. If you want to see for yourself what mining for gold is like, there are plenty of ways to try it out while you’re visiting Alaska. Fact 3: The presence of quartz rock could be an indicator that gold is near. Gold veins can occur in quartz formations. The History Channel’s “Ice Road Truckers” often features the challenging Dalton Highway. This 414-mile road stretches from Livengood to Deadhorse, the company town in the oil-producing Prudhoe Bay. However, the most intimidating drives you’ll see on the show are roads built across frozen water. The ice road season lasts from January to March, when truckers can travel on the frozen Arctic Ocean to reach oil field sites. Fact 4: The Dalton Highway is dangerous, even in summer. It’s mostly gravel. Cell phone coverage is spotty at best, and there are limited services and no medical facilities. You can encounter bears anywhere along the highway. You can travel the Dalton Highway yourself, but it’s best to go with a tour company or at least ensure you have extra tires and emergency supplies with you. National Geographic’s “Alaska State Troopers” shows us that dangerous traffic stops, drug use, burglaries and fights – the usual things troopers deal with – are compounded by additional risks in the Last Frontier. Alaska’s isolated villages, extreme temperatures, snow-blocked roads, icy conditions, unruly wildlife, and residents who’d rather be left alone all add to the challenges that these law enforcement officials face each day. Moose pose a danger, particularly in heavy snow seasons when they might venture into cities to look for food sources. Fairbanks has a high moose population, and when you stay here you’ll have an excellent chance of seeing them. But be cautious. Fact 5: Moose are aggressive and territorial, able to charge at 35 miles an hour, and people are injured or killed by moose each year. Law enforcement officers occasionally must step in to put down dangerous animals. Those moose are given to charity and the meat is distributed to the hungry. Now that you’ve learned a few key facts from Alaska reality TV shows, you’ll be ready to experience the Great Land yourself!